DICE recently released the first official trailer for the upcoming Battlefield 5 Firestorm game mode; the Battlefield 5 battle royale mode launching as the headline feature of ‘Trial by Fire,’ the third chapter of Tides of War. The trailer revealed that Firestorm will be coming to the game in a little over one week’s time, on the 25th of March. Now, DICE has given fans their first look at Halvøy, the Battlefield 5 Firestorm map. According to the studio, it’s truly vast. In fact, it will be the biggest map ever featured in a Battlefield game! When Firestorm launches on the 25th of March, the mode will be playable on just one map; Halvøy, a new map designed specifically for Firestorm. Given the mechanics of battle royale, it’s no surprised that there would need to be a dedicated Battlefield 5 Firestorm map. However, the sheer size of Halvøy is perhaps even larger than fans expected. The map will be the largest to ever appear in a Battlefield game. In fact, it dwarfs even the largest maps of Battlefield 5. At present, the largest maps in Battlefield 5 are Hamada and Panzerstorm, the latter of which was added post-launch through the Tides of War. 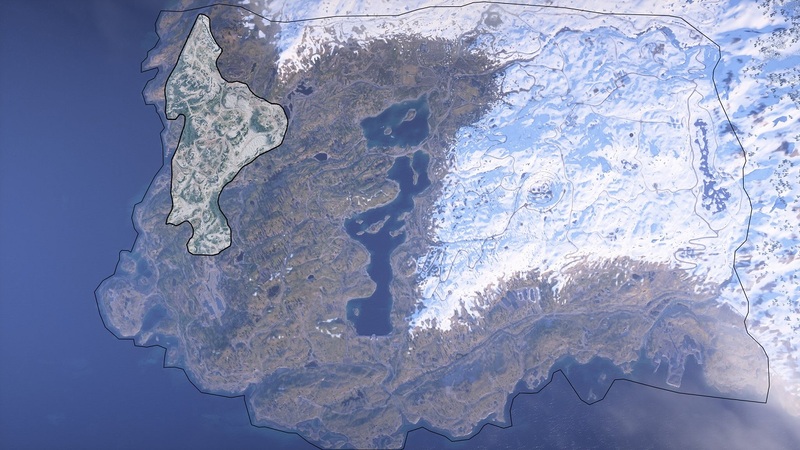 After Panzerstorm, Halvøy will only be the second new map to come to the game since release. However, this certainly isn’t the same as a normal map being released. After all, Halvøy will support the entirety of the Battlefield 5 Firestorm game mode; likely to be the game’s biggest post-launch content release yet. It currently unknown whether the map will solely be available for Firestorm, or whether portions of it might be available for other modes. DICE has made cut-down variants of maps available in the past, particularly for use with the Squad Conquest mode, so it’s at least a possibility.